Countless travelers from abroad have stayed at Fjærland Fjordstove Hotel & Restaurant to witness the beauty of the surrounding countryside. Yet, this interest is a recent development, as the hotel’s home of Fjærland spent many centuries beforehand as an isolated agricultural village hidden away within the towering, mountainous terrain of Sognefjord. This small hamlet was a part of a wider network of towns that lived secluded from the world for thousands of years. In fact, the first farms in the area emerged nearly two millennia ago. Its residents lived by simple means, raising grain, livestock, and produce. Apples, in particular, became a prominent crop, as many Medieval associated the fruit closely with the region. As such, the people of Sognefjord left much of the local landscape untouched, creating for a uniquely pastoral culture. This character persisted well into the modern era, even after several factories and mills popped up in the region. It was not until the mid-20th century, when travel to Sognefjord became commonplace. As maritime commerce started arriving more frequently, so too did exposure to the outside world. Soon, people from all over journeyed by boat to see the fjord’s beautiful, unspoiled geography. This interest only grew with the completion of the Fjærland Tunnel, which connected Fjærland more easily to its neighboring communities. Numerous hotels have appeared since then that cater to this new population of international travelers eager to revel in the majesty of western Norway’s natural wonders. 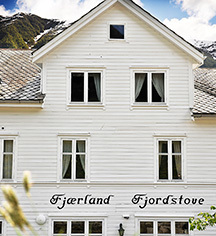 Among their number is the Fjærland Fjordstove Hotel & Restaurant, which owner Bård Huseby opened during the 1980s. 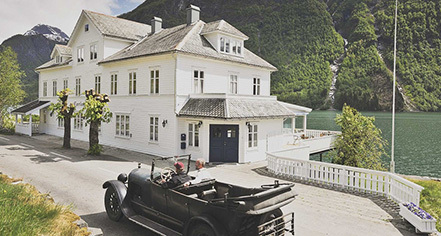 Using a quaint guesthouse constructed some fifty years prior, Huseby spent every last cent he had to create Fjærland Fjordstove Hotel & Restaurant. His efforts were not in vain. This fantastic boutique hotel still ranks among the country’s most popular destinations, allowing for its guests an amazing opportunity to experience the region’s historical, bucolic charm.